Do you ever have a mid week movie night? We recently started a "no tv during the school week" rule and have warded off tv until the weekends. But, as a small reward for being well behaved and focused at school...we decided to have a mid-week movie night! We could also us some cuddling time on the couch. 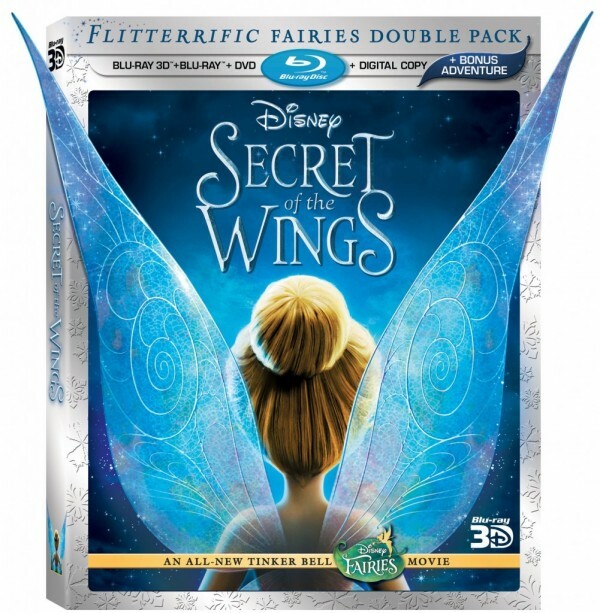 So planned for tomorrow is the new Tinker Bell Disney Fairies Movie, Secret of the Wings! The new feature film takes Tinker Bell and her fairy friends on a journey into the forbidden world of the mysterious Winter Woods, where curiosity and adventure lead Tink to an amazing discovery. It introduces the sparking new winter fairy, Periwinkle, and reveals a magical secret that could change Tinker Bell's life forever. Now, if you are like me, you've been overhearing the preview to this for a while on the Disney channel, so I'm sure the twins will be excited to watch it! For an added bonus, I have 5 combo packs to giveaway! Want to win? Leave me a comment with your favorite way to treat your kids during he week and I will choose 5 random readers! Contest will end Thursday at 11:59 pm and well update you with a review and the winners on Friday! Looking forward to reading your entries and hoping for a great week ahead! My favorite treat for my son is a surprise visit from a friend. I try to get in touch with a mom of one of his friends to see who can come over and surprise my munchkin with some fun. I make treats and we always have something fun to do. Hi Alvina! I am going to repost the giveaway, but I'll be sure to send you a copy! Gracias!